This morning Tarik Chekchak, Science and Environnement Director in The Cousteau Society environment presented in the company of Rémy Marion of the NGO “Poles Actions”, a presentation about the polar bear in the light of climate change challenges. 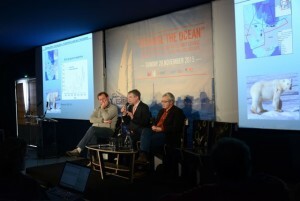 The session was held within the Tara “Ocean and Climate” pavillion, as part of a day devoted to Arctic issues in the context of COP21. Among the key points of the morning session, were explored the consequences of the drastic reduction of summer pack ice on the Arctic Ocean and the climate. The roundtable focusing on ecological consequences, brought together Rémy Marion, a specialist in polar regions and co-author of the book “Geopolitics of Polar Bears”; Olivier Gilg, Chairman of the Research Group in Arctic Ecology (GREA) and Tarik Chekchak. 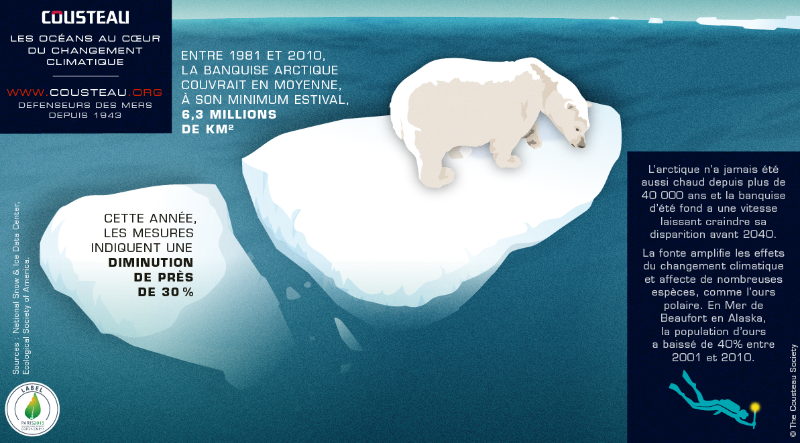 The Cousteau Society insisted on the need to adapt to the probability that we may lose summer sea ice no later than 2100 in the Arctic, with very large impact on ecosystems that depend on pack ice, including the iconic polar bears. Recognizing this, we recommended to identify areas, especially in northern Greenland and Canada, which could host summer ice relics and become refuges area that should thus be granted with high level of protection.